1st up is the Texas Ranger. There are several varieties in this category but all are quite drought tolerant. 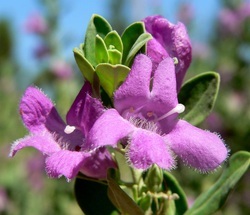 They wear a silvery gray foliage all year and blossom in the fall with contrasting blue to lavender pink flowers. The flowers appear almost over night. This is a great plant that loves the valley heat. Next a light airy vine.....Rosa De Montana. These light green heart shaped leaves appear in late Spring and the sprays of "happy" pink flowers appear right now. It is an unusual splash of high lighting color in the garden. Pair this vine with a Pink Mulley Grass and you will have quite a splash of color. This grass is pretty non discript until it explodes with it's wave of pink mist like flowers. A couple of tall columnar trees that show off with nice Fall Color are the Crimson Spire Oak (looks a bit like a poplar from a distance) and the orange-red Nyssa. I love both of these trees and both can be tucked into tight spaces as they grow tall but not too wide. Add these plants to your more traditional Fall "stand outs" to create interest and keep others guessing.............I love to add unexpected treats through out the garden & help personalize your space. Keep the pansies, but tuck in a couple of rocks with a pink mulley grass, stand back & enjoy the new look. Remember Fall is the Best Time to Plant, Why not try something different! At Robby's Nursery & Calico Gardens we have these plants and much more! Come by and visit the "Newest Old Nursery" in Town and don't forget our 20th Annual Fall Festival. Taking place Oct 6,7,13 & 14. Arts & Crafts Booths, Nursery Specials, Food and More.